To get to the first floor where the clock mechanism and where the bells are rung you climb a set of narrow stone spiral stairs. Was hung by V.m Wood, Josh. Redman being Architect & were opened & prizes were given, March 10th A.D. 1846.
ascended this Tower and rang Seven Treble bob Peals, viz. Primrose, College Treble, Kent, New London, Oxford, Violet, & Duke of York, in all 5040 changes, in two hours & 55 minutes. 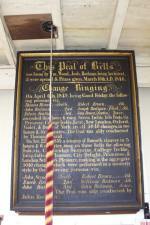 The Peal was ably conducted by Thomas Bland. 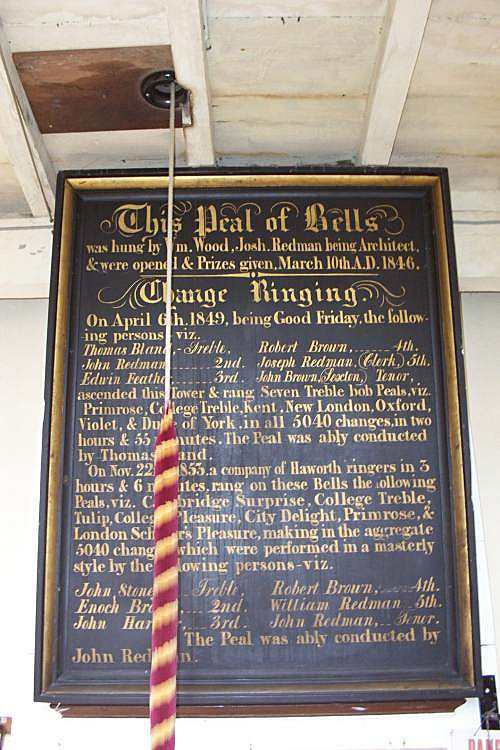 On Nov 22nd 1853, a company of Haworth ringers in 3 hours and 6 minutes rang on these bells the following Peals, viz, Cambridge Surprise, College Treble, Tulip, College Pleasure, City Delight, Primrose, & London Scholars Pleasure, making in the aggregate 3040 changes, which were performed in a masterly style by the following persons- viz. 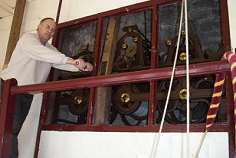 Jens Hislop (picture right) the Parish Horologist on the gantry, winding the clock. It takes in the region of 300 turns to keep the clock going for 7 days. 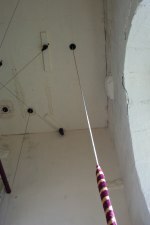 The chimes also need to be wound. 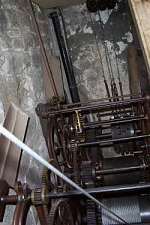 Picture left is the mechanism that drives the clock and the bells. The final drive to the clock faces is the furthest bar left of picture.